I’m pretty new to the idea of thrift shopping, and I haven’t had much luck with local stores in my area. Since I told you about ThredUp, they received and processed my items. I earned around $25 and most of my pieces sold the first day they were listed, so I’m pretty pleased with the process. In the meantime, I returned a pair of jeans that didn’t fit me and found two pairs that did. 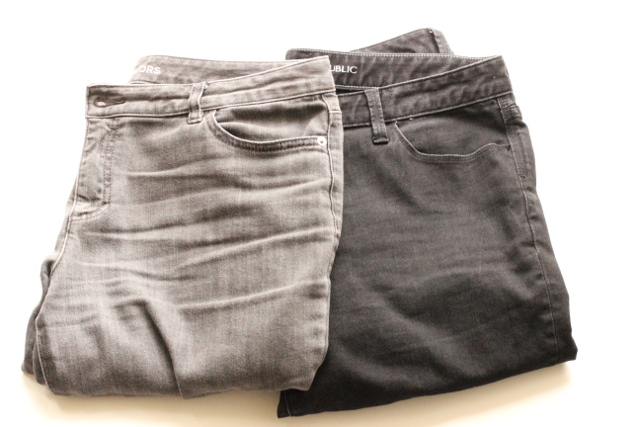 I’ve been hoping to add black and grey jeans to my wardrobe, and at ThredUp’s prices, I was able to get two pairs. Shopping for jeans online is always risky, and though I’m really familiar with how to measure and determine my size, I often fall between sizes with jeans. Since I’m definitely fuller in my hips and thighs, I find that jeans are too loose around my waist. Both of the pairs from ThredUp are mid-rise, which I really like. They were both a smidge on the snug side, so I searched for ways to stretch them just a little. As it turns out, denim can stretch up to one inch, which was exactly the amount of room I needed! I found this interesting post about stretching your jeans with a really sweet movie clip featuring the tub method. In the end, I just washed both pairs in cold water and hung them up to air dry. As they were drying, I gave each pair a good stretch in the waist and hips, and once they were dry, I wore each pair around the house during the day (not at the same time, of course!). Now, they fit really well and are comfortable, too. Problem solved. And my friend, Lindsay, who is launching a jewelry site soon, moved to a different apartment recently and was letting go of a lot of her wardrobe. 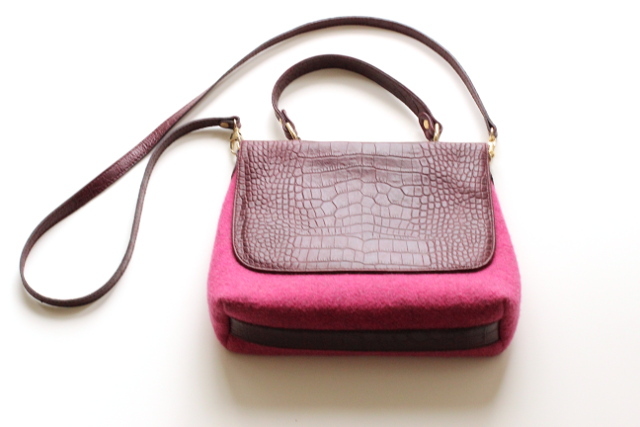 I had admired this pretty pink purse in the past, so she gave it to me! I’m so excited to use it, and it will be a colorful addition to my casual wardrobe. I also used some of my ThredUp credit to buy some summer things for the boys, and I’m preparing to send off another bag of donated items soon. I’m getting used to this thrifting thing, and I really enjoy how easy the process is. I am awful at thrift shopping! I never know what sizes I might need, and I get so overwhelmed by all the jumbled items! I admit I don’t like the process, either. The children’s consignment stores are usually pretty nice, but they don’t have much in the way of boys’ clothes. So exciting! I bought a couple of jeans on thredup; one pair fits through the leg and is too big at the waist and the other is just lower quality than I expected. I just sent in my bag, so we’ll see what my payout is. I LOVE thrifting (but I’m sure you already knew that from my blog). But it’s difficult to find fitted pants that actually fit regardless of where you shop for them. I’ve had pretty good luck with their jeans so far and the quality was good, too. In high school, I used to wear my sister’s old jeans because I love the worn-in feeling of jeans.